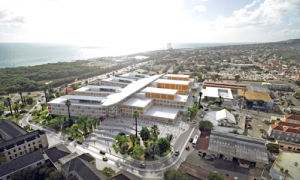 WILLEMSTAD - The quarrel between the Minister of Public Health Suzanne Camelia-Römer and the financial institution Sona about the finances of the construction of the new hospital continues in the media. Both accuse each other of giving incorrect information. The construction work itself does not seem to be delayed by this back fighting between the government and Sona. The structural work is completed in May and the hospital will be officially delivered in August. From there the second phase will start which is to move equipment and personnel to the new hospital.